St. Patrick's Day is Friday! 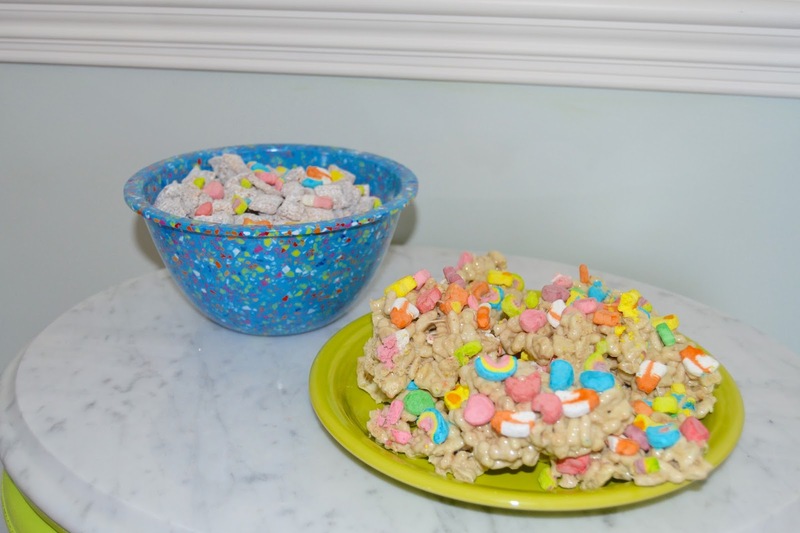 You can get festive with these super fun, easy to make snacks featuring your favorite cereals. In less than 15 minutes, you can have a tasty treat ready and I altered both recipes to make smaller portions - perfect for a college student! Start by spraying an 8x8 dish with nonstick cooking spray so it has time to sit while you're preparing the bars. Melt your butter in a big pot on low heat and add just a pinch of salt if your butter is unsalted when it has melted. Add in the marshmallows to the melted butter. You can use any size marshmallows but if they're bigger, break them into small pieces while adding them to melt quicker. 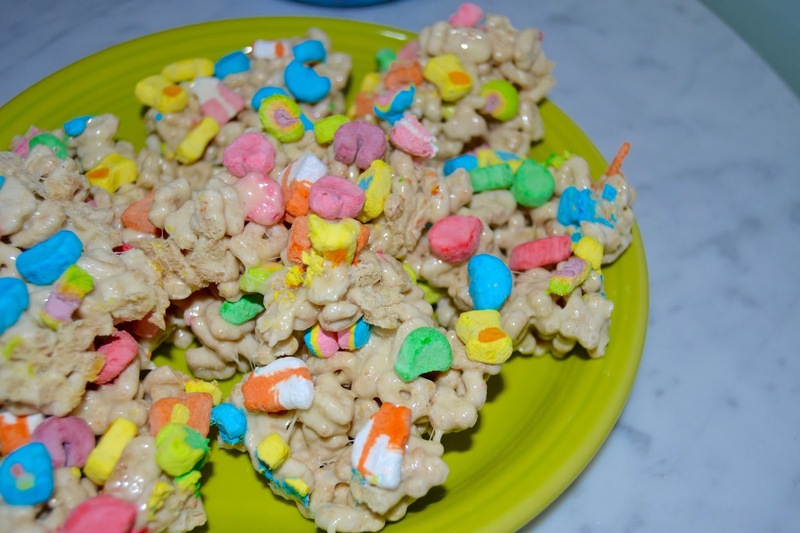 Stir consistently until all of the marshmallows have melted. Turn your burner to the lowest setting or move the pot off the burner and add in the Lucky Charms cereal. I separated the cereal pieces from the colored marshmallows so that I could put the marshmallows on top, but you can add the cereal straight from the box. Stir cereal in until it seems to be mixed evenly and pour it into your sprayed dish. Lightly press the mix into the bottom of the dish so that you can create even bars. 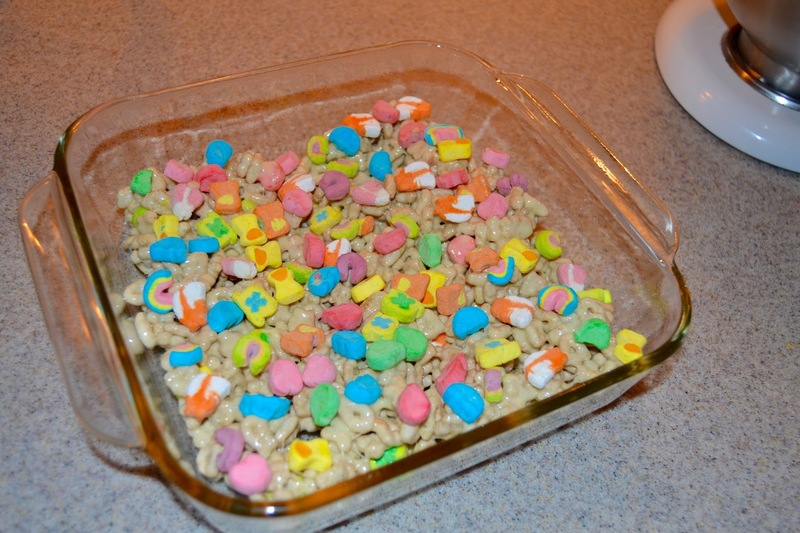 If you separated the marshmallows, add them to the top of the bars right away. Let the mix sit for about 15-20 minutes before cutting them into squares then enjoy! 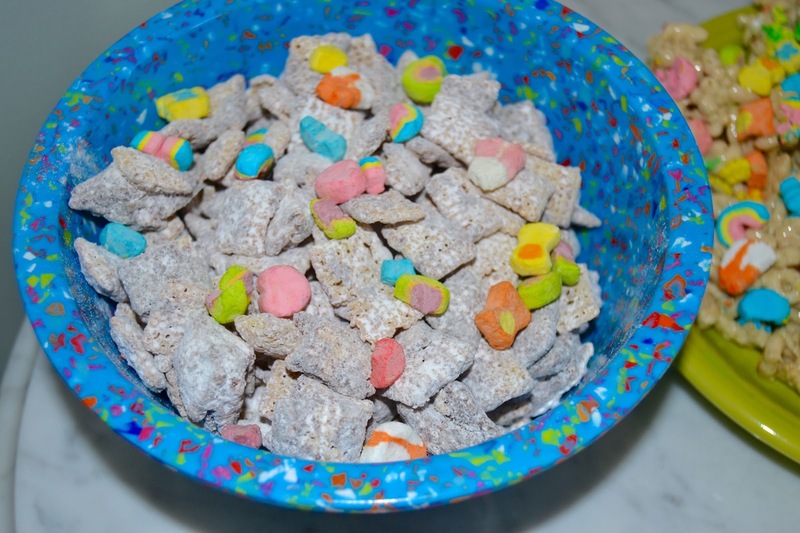 I used the recipe directly from a Chex cereal box but changed the amounts because their recipe seems to be more suited for a party than a small group. You'll still get more than enough and it lasts for days. First measure your six cups of Chex cereal into a large bowl. I prefer corn Chex but rice Chex is also good! Add your semisweet chocolate chips, butter, and peanut butter into a slightly smaller glass bowl. Heat those in the microwave for one minute, stir, and heat again for 20-30 seconds until you're able to stir the mixture smoothly. Once you have a smooth mix, you can add the small amount of vanilla and stir that in. Pour your mixture into the large bowl of cereal that you set aside before. The box says to stir the mixture into the cereal but I found that it's more effective to use your hands. It'll get messy but you can do a better job at getting the peanut butter-chocolate mix on all of the cereal pieces. When you're happy with the coating of your Chex, add the cup of powdered sugar into a gallon sized ziploc bag and then add your cereal mix. 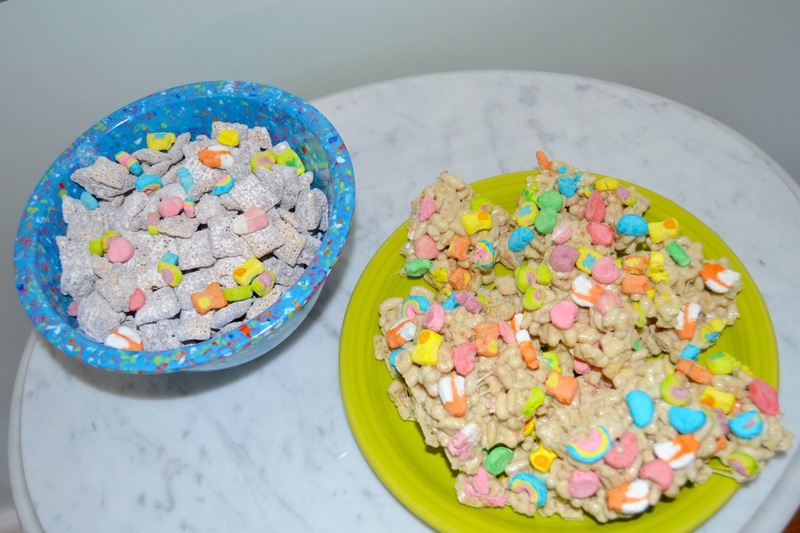 Shake the bag until all of your cereal pieces are covered in powdered sugar. Your Muddy Buddies are ready to go! You can leave them in the bag or serve them in a bowl. 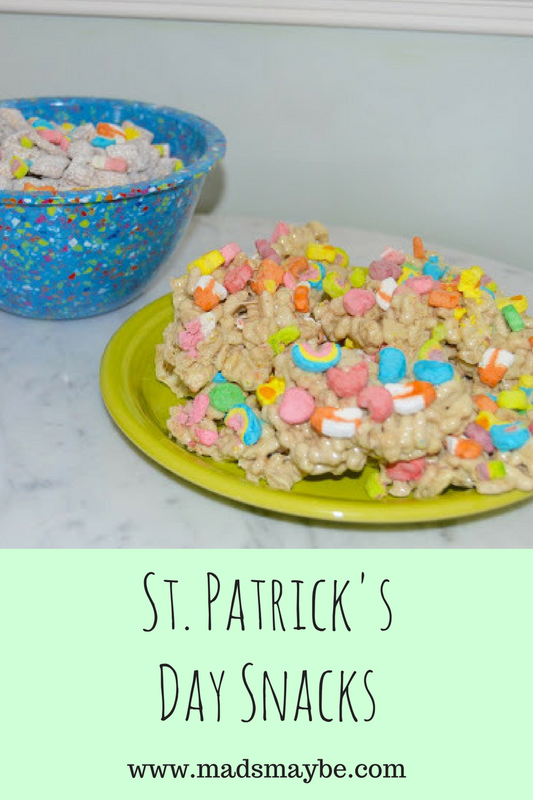 I added some Lucky Charms marshmallows that were leftover from the bars to make the snack a little more St. Patrick's themed but you could also add in green m&ms! 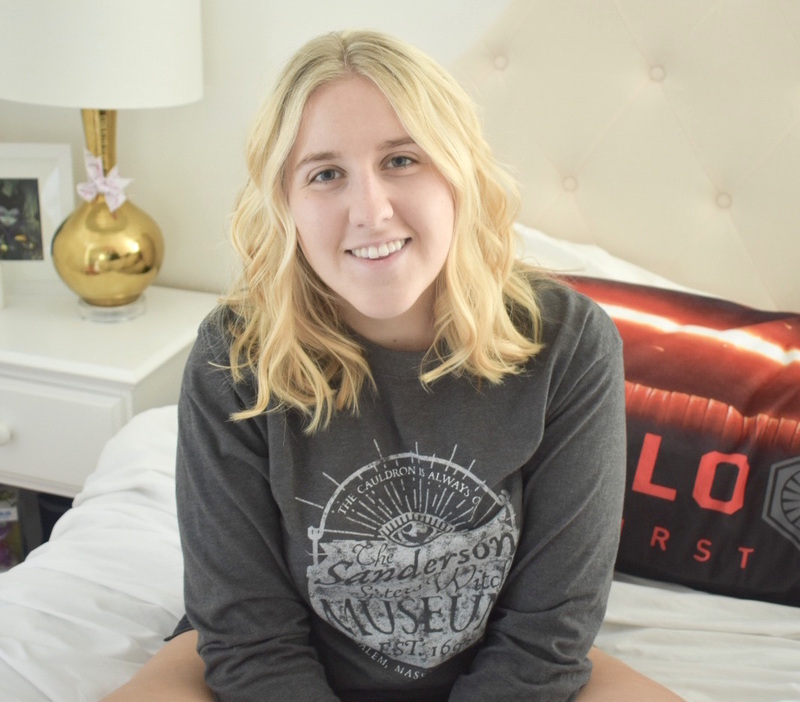 Oh so cute and oh so simple!